It's true that the newest revelations about Facebook's involvement in the US elections cast a gloom on how the social network protects its users' data. However, the wave of distrust doesn't seem to have affected Messenger, the company's other social service. 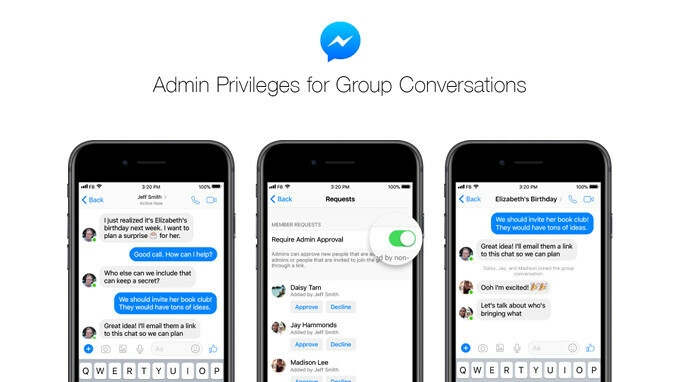 And so, Facebook has just announced an important update is now being rolled out to Messenger, which is supposed to make the app “better than ever.” The update adds more privileges for admins that allows them to approve new members before they join their group chat. In addition, admins will have the ability to remove members whenever they think it's necessary, as well as promote or demote other persons in the group chat as an admin. If you're an admin in a group chat, you'll be able to set Messenger to notify you when a new member wants to join the group chat, but you can also turn this option off and allow any person who wants to join it to do so without your approval. Another important improvement is the addition of joinable links, which will make it easier for Messenger users to add new people to group chats. Any member of a group chat can create a joinable link and send it to other persons he/she wants them to add to the group. As per Facebook's announcement, the new features will be rolled out to Messenger for mobile starting today, so make sure to check for the update in the App Store and Google Play Store.